Fly from your chosen UK departure airport to Catania and transfer to Taormina. Dinner and overnight in the hotel. Breakfast in Hotel. Brieﬁng with the tour guide and departure to Savoca which was chosen by Francis Ford Coppola as the location to shot the ﬁ lm “The Godfather”. On to Cefalù to visit this lovely medieval town and its famous cathedral, one of the most beautiful in Sicily. Continue onto Palermo. Arrival at the hotel in the afternoon. Dinner and overnight. (Optional visits to Palermo & Monreale) Breakfast in hotel. Visit to the Teatro Massimo, the third biggest opera theatre in Europe. Then we enter the popular market “Il Capo”, that looks like an African souk; at the end of the market tour there will be a tasting in a bar of the typical Sicilian “Arancina”, a speciality local street food. At this point guests can choose to leave the group for individual activities or to take part in the optional guided tour of Palermo and Monreale (€ 35 per person). In the afternoon there will be an excursion to Monte Pellegrino and Mondello. Monte Pellegrino was once described as the most beautiful promontory in the world by Johann Wolfgang Goethe. Continue onto the small ﬁshing village of Mondello with its marvellous beach, where you will taste a typical Sicilian sweet. Dinner and Overnight. Breakfast in the Hotel. We head to Erice, the medieval town on the summit of Monte San Giuliano. Our guided tour will take you to the Norman Castle and the Cathedral. There will be a stop at a bakery shop to taste the typical almond pastry of Erice. Then onto Marsala, famous for the production of wine (wine tasting in a winery). Dinner and overnight at hotel in Agrigento area. Breakfast in the hotel. In the morning drive to Agrigento and with our guide you will visit the Temple Valley, where you can admire the Temple of Juno, the Temple of Concorde, the Temple of Hercules and the Temple of Castor and Pollux. Then onto Piazza Armerina where you will have a short break for tasting some typical Sicilian food like olive pâté, olives, marmalades and wine. Onto Taormina Mare, where you will arrive in the late afternoon for dinner and overnight. Breakfast in the hotel and guided excursion to Mount Etna, the highest and most active volcano in Europe. There will be a stop at a local beekeeper for a honey and wine tasting. 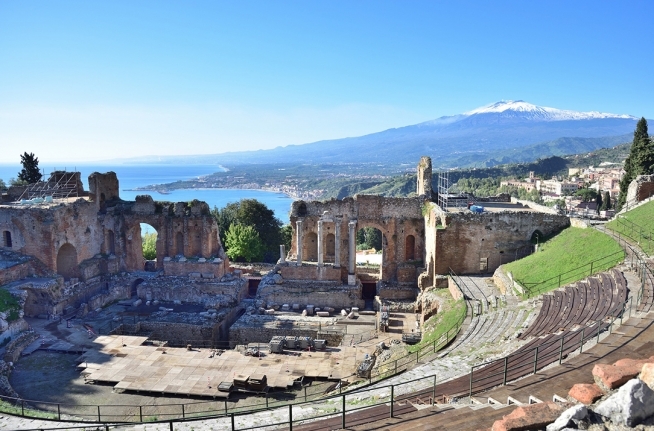 In the afternoon there is a visit of Taormina, situated on a plateau on the slopes of the steeply dropping Monte Tauro, dominating the Ionian coast from Capo Sant’Andrea to Capo Taormina. Possibility to visit the Greek-Roman theatre, the 2nd largest classical theatre in Sicily. Back to the hotel for dinner and overnight. Breakfast in the hotel. Full day excursion. First stop in Catania, rich in baroque buildings; visit to the typical ﬁ sh market and walking tour of the city centre. Proceed to Syracuse, one of the most interesting archaeological sites on the island. At this point guests can choose to leave the group for individual activities or to take part to the optional guided tour of the archaeological park of Syracuse (€ 30 per person + € 10 entrance fee), including the Roman Amphitheatre, the Greek Theatre, the Ear of Dionysus. Back to the hotel for dinner and overnight. Breakfast at the hotel. Depart by private transfer to Catania airport for your ﬂight back to the UK. Entrance fees to museums, monuments and archaeological sites.